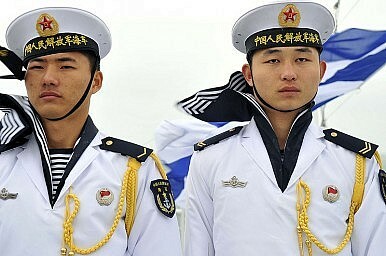 The “revelation” that China’s military is planning for a quick war with Japan should shock no one. So Captain Jim Fanell, grand intel wizard for the U.S. Pacific Fleet, made headlines this year — again — at the WEST conference on maritime affairs out in San Diego, California. And again, the headlines come from speaking the plain truth in un-politically-correct language. Captain Fanell opines that China is preparing for a “short, sharp war” with Japan over the Senkaku Islands. ‘Zounds! Who’d’ve thought military forces prepare for armed conflict in peacetime? Or that they prefer to fight short, sharp wars rather than long, dull ones? George Washington, call your office. Now parse Jim’s words. (The Naval Diplomat was sitting next to him when he uttered the unutterable, so I get to be familiar.) Enlightened opinion on this side of the Pacific Ocean evidently finds one of two things unfathomable: that Beijing is contemplating war, or that the People’s Liberation Army prefers to avoid a protracted test of arms should one prove unavoidable. Let’s take those possibilities in turn. First, what else should PLA strategists do than plan for a war to uphold what the political leadership obviously considers an important national interest? I hate to sound sympathetic, as I have no truck with the purposes impelling China’s foreign policy vis-á-vis Japan. But that’s a quarrel with Chinese policy, not Chinese maritime strategy or its executors. Armed services exist to furnish their political masters options in times of trouble. Thinking about the unthinkable — and doing advance legwork should statesmen deem the unthinkable thinkable — is what they do. Indeed, commanders commit malpractice if they fail at this basic function. Flip matters around and look at them from an American standpoint. It’s naïve to wonder, for instance, “who authorized preparations for war with China?” Well, the framers of the U.S. Constitution presumably didn’t expect the U.S. Army and Navy to be potted plants when they empowered Congress to raise land forces and maintain a navy and vested presidents with the authority to conduct foreign relations. That’s who. The framers expected, and current officeholders expect, military commanders to gaze through a glass darkly into the future — and to prepare for the most consequential contingencies, the most probable contingencies, or both. Hence U.S. efforts to counter anti-access warfare and other Chinese innovations. It’s hard to improvise such countermeasures on the fly. It’s also irresponsible for military leaders to game the strategy-making process, foreclosing certain options or pressing others on policymakers. That’s why proclaiming that one course of action is “the” solution to some politico-military dilemma or another is so problematic. If military commanders take a one-size-fits-all approach to complex problems, they hand policymakers a stark choice in wartime: select the only option on the table or do nothing. That amounts to the tool — the military — instructing the repairman — the president or prime minister — how to do his job. Do Western commentators really believe PLA officials would shirk their duty? One hopes not. Chinese strategists are obliged to get ready for likely and serious contingencies, just as America and its allies prepare. Taking the prospect of war seriously is part of that duty — on both shores of the Pacific. And second, what about the short, sharp part? This is the interesting part of the debate. In very broad terms, there are two strains in Chinese strategic culture. One favors protracted war, the other prizes quick, decisive victory. We can put Mao Zedong’s face on the former, Sun Tzu’s on the latter. But does China really prefer Maoist methods of protracted war? Does Beijing automatically string out armed conflicts? No. Even for Mao, conventional victory is the ultimate goal, protraction a mere expedient in situations where China starts off as the weaker combatant. There’s little reason to think the Great Helmsman relished the grind of irregular warfare and what-not. If China starts off as the stronger antagonist, then, why wouldn’t it take the swiftest and surest route to success? Sun Tzu warns that no protracted war ever benefits the state. Such conflicts sap the national treasury and other warmaking resources while leaving the state vulnerable to predatory neighbors — even in victory. That being the case, why not heed Sun Tzu’s wisdom if China is the stronger competitor in the East China Sea? Beijing is doubtless content to win through Sun Tzuian methods if it can. However execrable a statesman, Mao the war leader counseled sagely against letting strategic doctrinaires, or “chatterers,” dominate debates over strategic and operational questions. He professed a more supple approach contingent on relative strength. In this case, at least, it may be wise to listen to the man brandishing a Little Red Book. If Beijing confronts a united U.S.-Japan alliance, it may incline to the protracted approach. If the alliance shows fissures, suggesting that China can go mano-a-mano with a peer or weaker Japan, then Beijing may indulge its Sun Tzuian proclivities. It may strike suddenly, like a hawk — as the grand master advises. While on a post-presidential trip to Asia, General Grant mediated Sino-Japanese talks over the Ryukyu Islands.